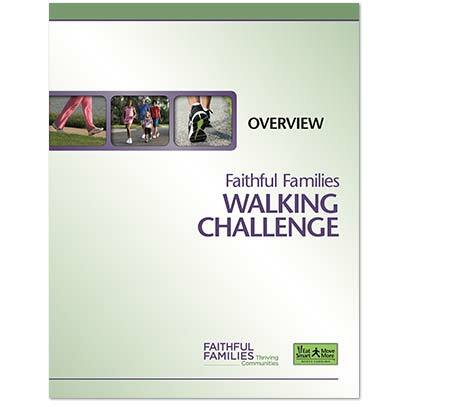 The Faithful Families Walking Challenge is a fun way to encourage everyone in your faith community to walk more every day. During the four-week event, participants challenge each other, such as friends and family, to increase how much they walk from week to week. The Challenge Overview provides step-by-step instructions and guidance on organizing the event. Weekly newsletters contain tips and ideas that anyone can use to walk more in their daily lives. Each participant will also receive a Walking Log, which offers an easy way to record the number of points accumulated each day during the challenge. Everything you need to plan, participate in, and evaluate the Walking Challenge can be downloaded here. After completing the challenge, please encourage participants to fill out the brief online survey. It should take no more than a few minutes to complete and will help us plan more physical activities for your community to enjoy.